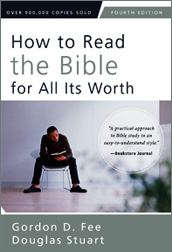 I have recently been revisiting a classic book that Wendy & I both read back in our early college days at Prov: Gordon Fee & Douglas Stuart's excellent How to Read the Bible for All its Worth. To be honest, both of us recall feeling like we "had to" read the book, back in the day. It was on our "required reading" list as a text, after all. Neither of us realized at the time what a true gem this book was and is (now in its fourth edition). College students tend to be like that, including Bible college students: we think we already pretty much know everything, and are only there to brush up on a few things. Usually by our senior year, we've realized how much we still need to learn. Life-long, as it turns out. I am amazed at how exciting this book is to me. You'd think a book like this would be mentally filed under "a helpful resource" (which it most definitely is! ), but "exciting"? Yes, actually. I'm thoroughly enjoying reading it (even reading parts of it out loud to Wendy -- "hey, listen to this!"). And I would heartily recommend this book to anyone who seriously wants to dig deeper into the Scriptures. You don't have to get a degree in theology first before this book is of any use. In fact, the opposite is true. Of course, one of the many things that Fee & Stuart invest time in explaining is the whole concept of "context" (how any given verse is part of a larger section which gives clues to understanding). This is important, because there have been far, far too many people who have ripped a single verse -- or even just a partial phrase -- out of its original context and created all kinds of wacky (and at times destructive) teachings. As the saying goes: "A text without a context is only a pretext" (clever, eh?). Which got me thinking about a certain passage of Scripture that has a tendency to cause people's blood pressure to spike just by mentioning it. Unpacking this passage is usually done to the soundtrack of people sharpening long knives if you dare to step in any of their sacred cow's droppings. You know, that passage in Ephesians that talks about wives, husbands, and submission. (Did your muscles just clench slightly when you read that sentence?) We all want to immediately dive in with our explanations of what "submit" means and doesn't mean, etc., don't we? But let's back up for a second. Context, remember? The passage has what I would like to call a "thesis statement", which is the main point of the passage. Everything else is an explanation of how Paul's main point is worked out in our relationships. Paul has just been talking about what it looks like to be "filled with the Spirit" -- something we all need and want. Read it again. Ponder it for a moment. Recognize that it's not just randomly placed there between verses 20 and 22. This is included in Paul's teaching on what it means to live our lives "filled with the Spirit". We submit to each other because of our deep, reverential respect for Jesus. Paul is providing this "thesis statement" before spelling out what that looked like for the 1st century Ephesian church (which had its own unique historical and cultural setting and issues). We need to recognize that this is all one section, a single discussion: it's not fair to separate the parts about husbands and wives from the words to fathers and children, or from workers and employers. It's all part of the same discussion, stemming from Paul's original thesis statement for living life "filled with the Spirit". Context. What a game-changer. Get Fee & Stuart's book. Highly recommended. The flags are at half-mast -- the Canadian flag, flanked by the flag of British Columbia, and that of the United Kingdom. A modest breeze provides just enough energy to make the flags fly. The same breeze is making the gathered crowd huddle into their winter coats a little more. The sun is shining, but the wind off the mountains is cold. There is a larger-than-normal gathering at the Rutland Cenotaph this year, as was true in many Canadian cities. The recent events in our nation's capital have resulted in an increased awareness and appreciation for those who have served our nation in the armed forces. People from all walks of life, and generations, are here. 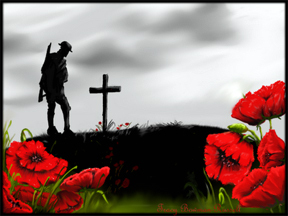 Paying their respects in silence to those who made sacrifices yesterday that allow us to enjoy a free country today. The cold gradually seeps deeper into the bones, the longer we all stand here. 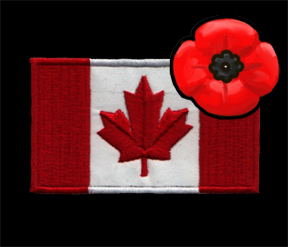 Bright splashes of red are everywhere, between the Canadian flags and the abundance of poppies pinned to jackets and sweaters. The sound of the bagpipes is mournful yet somehow comforting. The single bugle commands everyone's attention; the two minutes of silence providing mute testimony to the solemnity of the moment. Even the breeze has stopped; the flags now furled half-mast. From the elderly woman who collapsed in tears when the bagpipes began to play "Amazing Grace"; the restless group of young guys who were there nonetheless; to the somber-faced children accompanying parents & grandparents -- we remember. 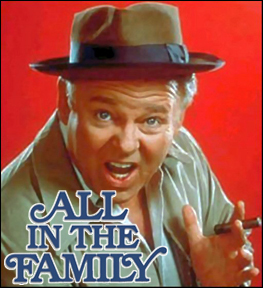 One of the most popular sitcoms during the 1970s was All In The Family, with its iconic lead character, Archie Bunker. Archie was an over-the-top, nasty piece of misogynist, racist, pro-Viet Nam, kill-the-commies, my-way-or-the-highway loudmouth. His character was deliberately offensive in order to point out how offensive some of his bigoted ideas were. He was satirical with a capital "S". 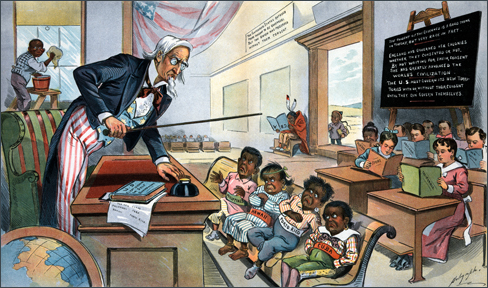 Part of the text on the blackboard makes mention of how the British Empire forcibly 'civilized' their colonies, and that America had the moral obligation to provide the same involuntary, unsought eduction for (in the front row): the Philippines, Puerto Rico, Hawaii, and Cuba. It's offensive, and it was meant to be. That's how satire works. Equally offensive: check out the unhappy black child washing the window, the Native American student seated away from the other children by the door (reading his book upside down), and the little Asian child standing alone and neglected outside. Yeah, the satirical intent of this cartoon is pretty blatant, and most of us would agree: rightly so. So, what's the relevance to 2014? After all, we are living in the "post-colonial" age, aren't we? After all, we are long past the arrogant elitism that set about t0 "educate the savages", right? We have learned from the mistakes of the past, and no longer try to import/force our culture and morals on other people groups or nations. Unless, of course, we in the Enlightened West decide that other cultures are too backwards. Or too archaic. Or in some manner mired in old traditional ways of thinking that We The West have decided are out-dated and therefore must be eradicated. In many news outlets, you hear terms like "it's the 21st century, and they need to get with the times". References are made to being "backwards", or "barbaric", or "out-dated". We label things "human rights issues" -- and they may justifiably qualify as such -- but the kind of language that we use reveals that We The West think we're smarter, more enlightened, more humane, and therefore we have the moral obligation and responsibility of getting the rest of the world to think just like us (politically correct). Are we in the West still trying to civilize the savages? I'm not convinced we're "post-colonial" just yet.